Busan Metropolitan City, also known as Pusan ( ) is the largest port city in South Korea and the fifth largest port in the world. Busan has a population of about 3.6 million. It is South Korea's second largest metropolis, after Seoul . The city is located on the Southeasternmost tip of the Korean Peninsula and faces the Korea Strait . The most densely built up areas of the city are situated in a number of narrow valleys between the Nakdong River and Suyeong River, with mountains separating some of the districts. Administratively, it is designated as a Metropolitan City. The Busan metropolitan area is divided into 15 major administrative districts and a single county. Busan was the host city of the 2002 Asian Games and APEC 2005 Korea. It was also one of the host cities for the 2002 FIFA World Cup, and is a center for international conventions in Korea. On November 14, 2005, the city officially announced its bid to host the 2020 Summer Olympics Games. Geochilsan-guk existed in the second and third and fourth centuries as a chiefdom of Jinhan. It was absorbed by Silla and renamed Geochilsan-gun. The word Geochilsan means rough mountain, probably referring to Hwangnyeongsan, located at the center of the city. The grave goods excavated from mounded burials at Bokcheon-dong indicate that a complex chiefdom ruled by powerful individuals was present in the Busan area just as the Three Kingdoms of Korea were forming, c. A.D. 300-400. The mounded burials of Bokcheon-dong were built along the top of a ridge that overlooks a wide area that makes up parts of modern-day Dongnae-gu and Yeonje-gu. Archaeologists excavated more than 250 iron weapons and ingots from Burial No. 38, a wooden chamber tomb at Bokcheon-dong. From the beginning of the fifteenth century, the Korean government designated Busan as a trading port with the Japanese and allowed their settlement. Other Japanese settlements in Ulsan and Jinhae diminished later, but the Busan settlement, called Waegwan at the time, continued until Japan invaded Korea in 1592. After the war, diplomatic relations with the new shogunate in Japan were established in 1607, and Busan Waegwan was permitted to be reconstructed. The Japanese settlement, though relocated into Choryang later, continued to exist until Korea was exposed to modern diplomacy in 1876. In 1876, Busan became the first international port in Korea. the Japanese rule, Busan (Fusan) developed into a hub trading port with Japan. Busan was the only city in Korea to adopt the steam tramway before electrification was introduced in 1924 . Busan, along with Jeju City , is the only city in Korea, with the exemption of Daegu , that was never taken by the North Korean Communists during the Korean War. As a result the city was a refugee camp site for Koreans during the war. Busan was one of the few areas in Korea that remained under the control of South Korea throughout the Korean War and for some time it served as a temporary capital of the Republic of Korea. UN troops established a defensive perimeter around the city known as the Pusan Perimeter in the summer and autumn of 1950. Since then, like Seoul , the city has been a self-governing metropolis and has built a strong urban character. Busan is located on the Southeastern tip of the Korean Peninsula. It is located on the coast, which determined the development of the whole city itself. Located on the Southeasternmost tip of the Korean Peninsula, Busan has a humid subtropical climate (Köppen climate classification Cfa). Extremely high or low temperatures are rare. May to July, Late Springs and Early Summers, are usually cooler than inland region because of the ocean effect. Late Summer and Early Autumn, August and September, are generally hot and humid and the city may experience typhoons at that time and be generally rainy. On September 15, 1959, Super Typhoon Sarah passed by the coast of the city and caused catastrophic damage. An unusually severe storm on September 12, 2003, Typhoon Maemi, also caused damage to ships and buildings and resulted in over 48 fatalities. October and November are generally the most comfortable, with clear skies and pleasant temperatures. Winters are cold and dry with high winds, but much milder than other parts of Korea except Jeju-do and several islands of the southern coast. Busan and the nearby area has the least amount of snow compared to other regions of Korea due to its location. Snow falls on an average of only about 6 days per year. Even a little accumulation of snow can effectively shut down this seaport city because of the hilly terrain and unfamiliarity of motorists with driving on snow. Busan is the fifth busiest seaport in the world, with transportation and shipping among the most high profile aspects of the local economy. Since 1978, Busan has opened three container ports including Jaseungdae, Shinsundae, and Gamman. Busan is renowned as one of the world's largest ports and can handle up to 13.2 million TEU shipping containers per year. The Busan-Jinhae Free Economic Zone Authority, one of two such administrations (the other in the harbor of Incheon ), was created to reassert Busan's status as a traditional international trading centre. The port attracts ships from all over the globe and the surrounding area aspires to become a regional financial centre. Commercial areas are dispersed through the city near busy intersections and adjacent to university campuses, but the two largest central business districts in Busan are Seomyeon and Gwangbok-dong/Nampo-dong. There are also four substantial shopping areas of note: Seomyeon, Gwangbok-dong, Busan Dae Hakap in Jangjeon-dong, and Haeundae. Seomyeon is the crossroads of Busan. The local subway station serves two lines and is one of the busiest in the city. The local head offices of Korean and international banks are located in Seomyeon. It is recognized as the ascendant shopping and entertainment district. Directly adjacent to Seomyeon is Bujeon Market, the largest traditional market in the city. Other companies with offices here include Yeolmae Food. The Gwangbok-dong, Nampo-dong, and Jungang-dong areas form the old central business district. Some of the restaurants in this district are locally famous with family recipes passed down the generations. Jagalchi Market (near part of the very active port) is an area of narrow street stalls and is well known for its fish market. The Gukje Market is also located nearby. Jungang-dong is the home of many international law offices, the old Immigation Office, and the international ferry terminal serving Japanese routes. Lotte World II is currently under construction along the water between Jungang-dong 7-Ga and 8-Ga.
Dongnae-gu is a wealthy and traditional residential area. Dongnae Oncheon is a natural spa area with many baths, tourist hotels, restaurants, clubs and shopping areas. Many restaurants in the area are famous for their family recipes. 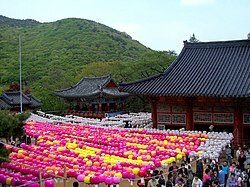 Chungnyeolsa is a Confucian shrine for soldiers who died during the sixteenth century battle against the Japanese at Dongnae Fortress. Busan is called the summer capital of Korea since it attracts tourists from all over the country to its six beaches. Luxury hotels and a carnival boardwalk line the beach at Haeundae. Gwangalli Beach is famous for its cafes, bars, and restaurants along the beach, and the Grand Gwangan Bridge. The area around Pukyong National University and Kyungsung University has many cafes, bars and restaurants attracting college students and youth. The area known as the "Foreigners' Shopping Street", but commonly referred to as "Texas Street" near part of the Port of Busan, has many businesses that cater to the local Russian population, as well as the crews of foreign ships. The area was originally the location of the local Chinatown and still contains a Chinese school. Because of the Chinese presence, the area was designated to serve as the commercial and entertainment needs of American soldiers, and businesses were set up there during the 1940s and 1950s to cater to them. Since 1982, the city has been home to the Lotte Giants, who play in the Korean baseball league. In Korea, Busan is known as the capital of baseball and has a reputation for very enthusiastic baseball fans . For the first few years, Lotte Giants utilized Gudeok Stadium as their home. In the mid-1980s, they moved to Sajik Stadium, which was built as part of a sports complex for the 1986 Asian Games. The city is home to K-League soccer team Busan I'Park. They were formerly known as the Daewoo Royals and were a strong team during the 1990s in the K-league. It is also home to National League soccer club Busan Transportation Corporation. Busan also has a basketball team (KTF Magic Wings) that plays in the Sajik Sports Complex area of the city. During the Korean War, Busan was the biggest refugee destination on the peninsula; people from all regions of Korea came to Busan. Some of these refugees stayed and adapted and adjusted the recipes of their local specialties. One of these foods is milmyeon (밀면) (lit. 'wheat noodle') a version of naengmyeon, cold buckwheat noodle soup, but using wheat flour instead. Naemyeon is originally a specialty food of Hamhung and Pyongyang , the northern regions of the Korean peninsula, now part of North Korea . Dwaeji gukbap (돼지국밥) (lit. 'pork/pig soup rice') is also a result of Korean War. It is a hearty pork soup and is becoming more popular nation-wide. 134 routes of urban buses service whole part of Busan Metropolitan City. Busan Harbour Pier 1 with the International Ferry Terminal (3 docked ferries shown). The Coastal Ferry Terminal serves ferry services to many locations on Geoje Island as well as to Jeju City in Jeju-do . Ferries leaving from the International Ferry Terminal on Busan Harbour Pier 1 connect Busan to the Japanese ports of Izuhara and Hitakatsu on Tsushima Island , as well as the cities of Shimonoseki, Fukuoka, and Osaka on Japan's mainland. The other ferry service to Fukuoka is assumed by the Beetles and the Kobees, 2 fleets of high-speed hydrofoils operated by Mirajet. About five departures from each city are scheduled every day. By hydrofoil it only takes 2 hours 55 minutes to cross the Korea Strait to Fukuoka. The Beetles are owned by JR Kyushu. Busan lies on a number of rail lines, of which the most important is the Gyeongbu Line which connects it to other major cities such as Seoul , Daejeon , and Daegu . All classes of trains run along the Gyeongbu Line, including the KTX trains which provide service to Seoul in approximately 150 minutes. The Gyeongbu Line terminates at Busan Station . Other lines include the Donghae Nambu Line. The Busan Subway network contains three lines: 1, 2, and 3. The network is operated by the Busan Transportation Corporation. The Busan-Gimhae Light Rail Transit line is under construction for completion in 2010. The Port of Busan also has 6 sister ports.